Our Old Miners Cottage: Did someone say pizza? First we start with the "No-Tomato Sauce"
Steam carrots and beets until tender. We use that like tomato paste. 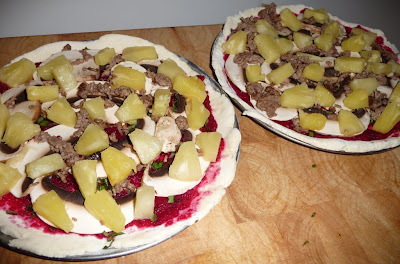 Then we cheat by using a pre-mix pizza-base packet from the supermarket. It's a mixture of gluten free flours and we just add the water and yeast. Makes life a little easier! 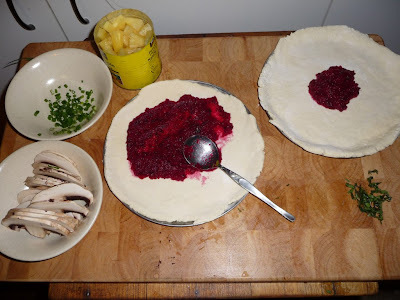 Roll out the dough onto pizza trays.. spread No Tomato Sauce on top..
Then add toppings. In our case, mushroom, mince, pineapple and chives/basil/herbs. Some would argue that it's not pizza without cheese, but they look like pizzas to us! I never get to take a picture of the pizza after they're cooked, because they're gone too quickly! Luckily there is plenty of leftover sauce for the next day's gluten free pasta, gluten free lasagne.. or - of course - more pizza! We mean to try chicken instead of mincemeat next time, too. This is all making me very hungry. I better finish tonight's dinner - roast meat and vegetables. Until next time!